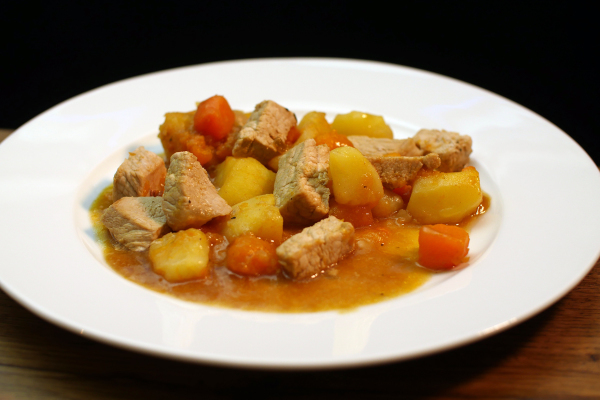 Stovies is traditionally a poor mans fayre as it mainly consisted of left overs or scraps of food. It's main ingredients are potato, onion, turnip and meat (eg. pork), all boiled down with a beef gravy. Start by chopping up an onion, par boil 6 potatoes and chop in half adding the par boiled turnip. Chop your choice of meat into cubes. Add beef dripping sourced at your local butchers to a frying pan and add the chopped onions lightly fry and add to a big casserole pot for the final boil down. Lightly fry the potato and turnip once again adding it to the casserole pot. Lastly lightly fry the meat and add to the casserole pot. Finally add 500ml of beef gravy and boil down all the ingredients taking about 10-15 minutes and serve.